Wide-angle photography is difficult. I will do my best to make it easy. The truth is, it can take years of practise to get good at wide-angle photography. 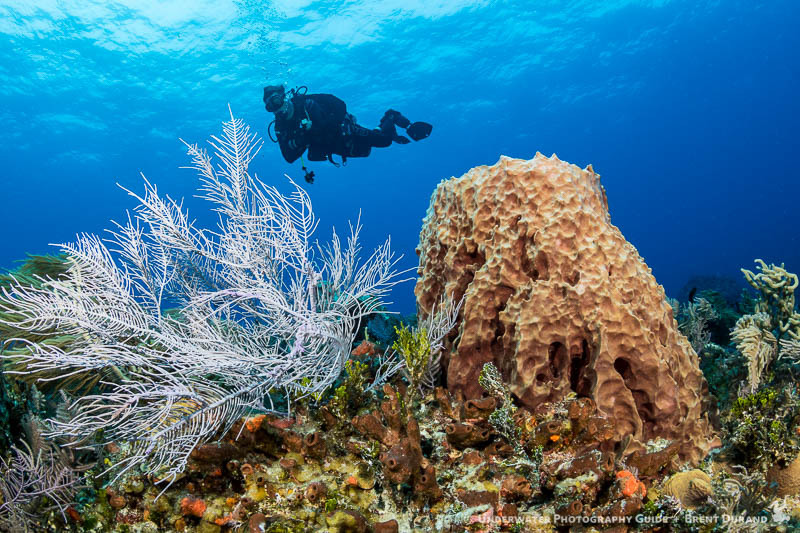 Reading this article will help, going on one of our underwater photography workshops will help even more. 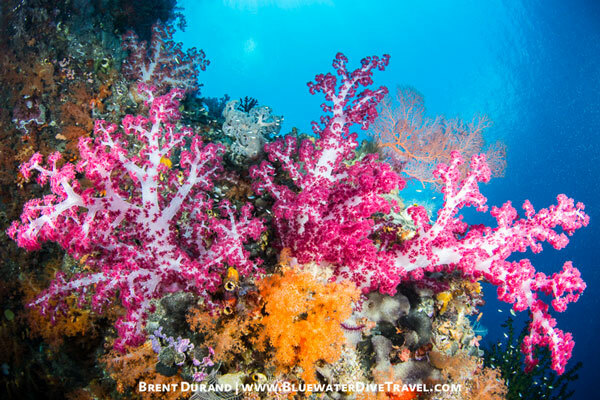 #1 - Get a wide-angle lens, read our best underwater lenses article. A fisheye lens is best. #2 - Learn the following: Lighting, Composition, Settings, Subject Selection. Details are further down. #3 - Learn what makes a beautiful wide-angle photo. Details are further down. #4 - Practice. Start with ambient light - use my top 10 ambient light tips , then practise lighting with strobes, then put the two together. #5 - Get feedback. This can be difficult. Most people will say "nice shot". 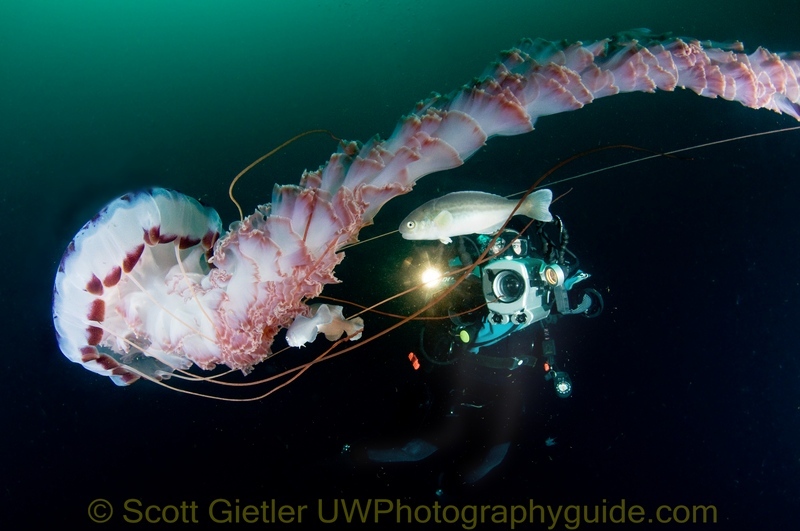 Ask some experienced underwater photographers to look at your photos, tell them you don't want to hear "nice job" or other compliments, just constructive feedback. Pick someone else's photo you want to aspire too, ask people how your photo stacked up to that one. If you are shooting with strobes, you will want to shoot in manual mode. That means setting the aperture, shutter speed, and ISO yourself. You can start with F8, ISO 100, 1/125th on your first dive. If I am shooting subjects further away, I may open up my aperture to F5.6. For close-focus wide-angle, or shooting into the sun, you will want your aperture to be smaller. If I am shooting in low-vis water, or subjects further away, I may increase my aperture to ISO 200. Your shutter speed will control the blue color of the water in the background. If it is too bright, make your shutter speed faster. If it is too dark, slow down your shutter speed. Now aways I do not use TTL for wide-angle, because it is difficult for the electronics to get the lighting right. Setting the strobe power yourself is not difficult after a little bit of practise. The number one mistake people make is not shooting at an upward angle - resulting in a low contrast photo. The 2nd mistake is trying to shoot a "scene" instead of a particular subject. The 3rd mistake is not getting close enough to the subject - 1 or 2ft away is best. We have many articles on the site that get into settings in more details, including settings for specific cameras. 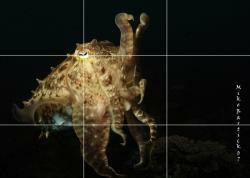 Strobe position is very important for wide-angle underwater photography. I recommend getting the best strobes that you can afford. When shooting wide-angle, I am moving my strobes around alot. I have them out wide for schools of fish, pulled in tight for close-focus wide angle, and one above the camera and one on the side when shooting vertically. You can try pointing the strobes at the subject, but that usually will result in some backscatter. The more particles in the water, the more you will have to point the strobes outward. When using a wide-angle lens, and especially a fisheye lens, you will notice that the dome shade protects the camera lens from strobe light when the strobe is directly overhead, or to the sides (the 12 noon, 3PM or 9PM position on a clock). Keep the strobes away from the corners of your photos (the 10PM / 2PM position on a clock). 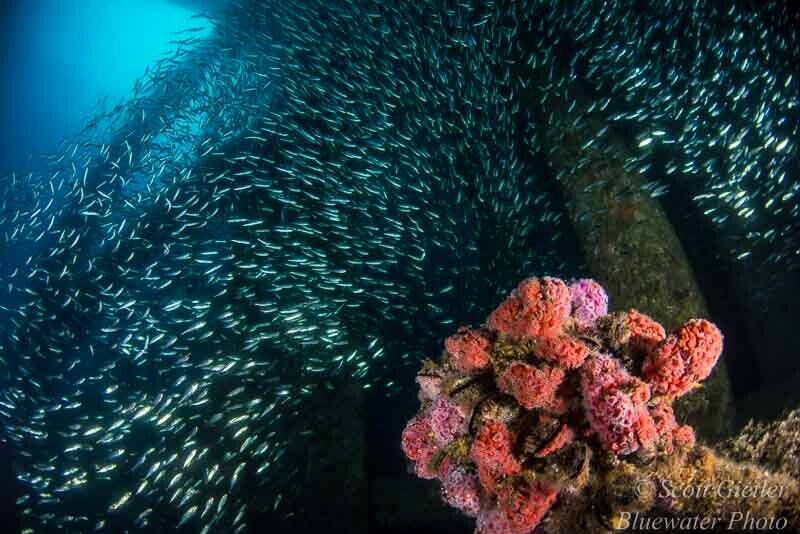 If you are using the Tokina 10-17mm fisheye lens, you will get much less backscatter at the 17mm range, which is focal length you should use when first starting out, shooting at 10mm is much more difficult. Most people do not make their foreground subject large enough in the photo. The foreground subject should take up a significant portion of the screen. A strong shot has a lit foreground subject, and a strong background subject like the sun, a dive model, a school of fish, or a structure. If I see the boat on the surface silhouetted, I'll often look for a subject to use as a foreground model for that shot. I also like using the sun in my photos. It is important to close down your aperture so the sun is not blown out, and you need to get close to your subject, because strobe light does not travel far when using small apertures. 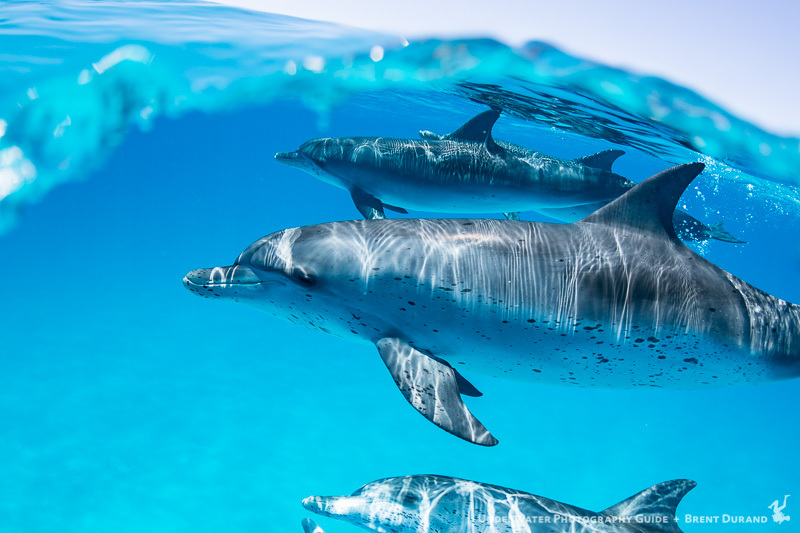 If I find a good foreground subject, I have been known to wait until a good background subject swims by, if there are good marine life subjects in the area. 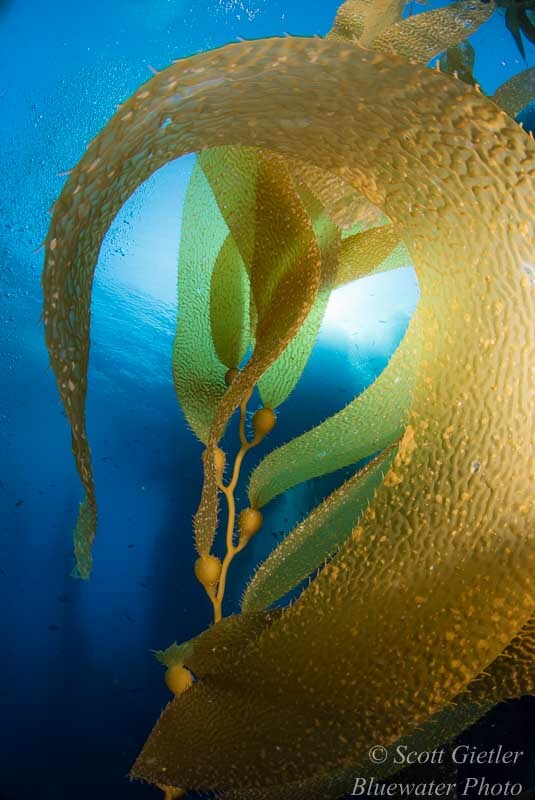 There is an entire section on underwater composition in the guide, I suggest you check it out! Starfish, crinoids, anemone fish, anemones, lionfish, squid, sea snakes, soft corals and sea fans all make great foreground subjects. Combine them with a background subject for an awesome photo. 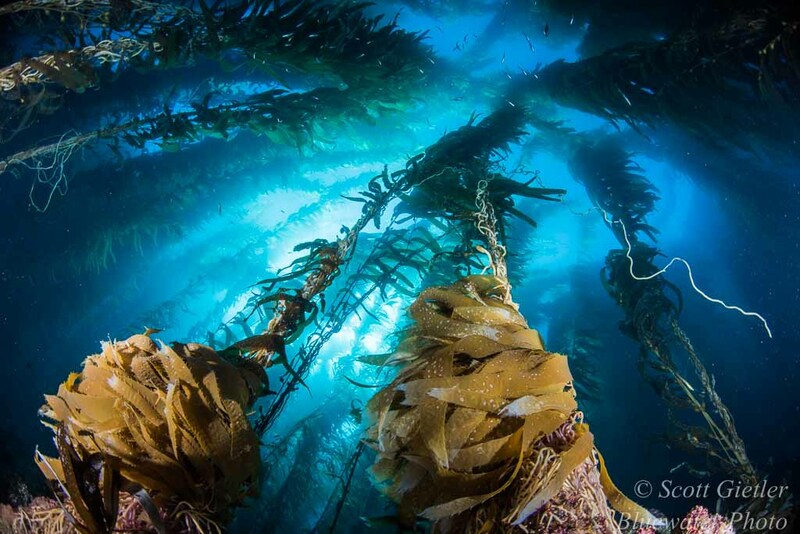 I like to use a sunburst, dive model, school of fish, boat silhouette, giant kelp or rigs structure as my background. Getting great colors means getting very close to the subject, filling the frame and having the sun behind the subject so there is not too much ambient light hitting the subject. Reds, oranges and yellows work best. A great subject like a sea lion, dolphin, shark, jellyfish, etc. can make a photo in its own right. You need to get close to the subject and light it well. If you get great eye contact, or get a diver in the photo, even better. Getting low on the subject, tilting your camera way back and shooting vertically so you get the sun in the photo can result in a nice high-contrast photo. Photo taken at a downward angle are often drab and low contrast. Leading lines, curves and spirals can all lead to amazing compositions. Over time you can train your eye to recognize these scenarios underwater. 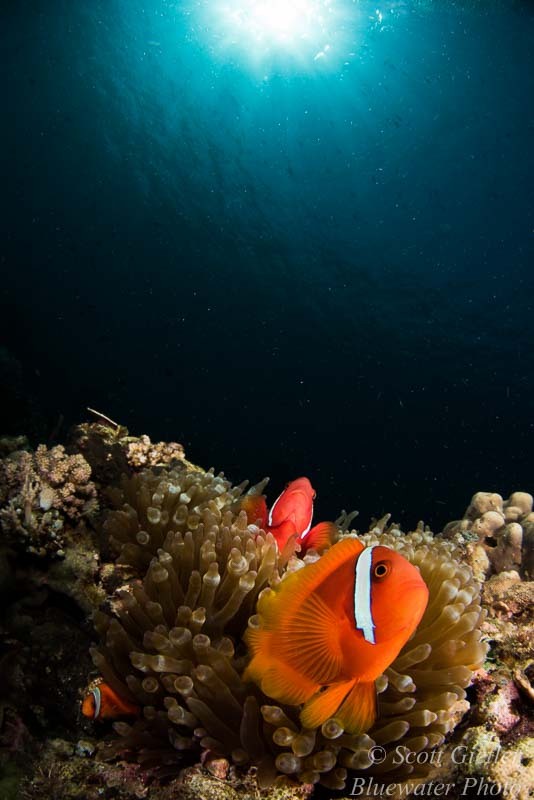 There's many ways to improve your underwater photography. One way is to shoot ambient light for a while. For someone trying to get better at wide-angle photography, this is what I recommend. First, start off just shooting blue water. Understand how to meter the water, understand what gives you the blue color that you prefer. Second, shoot the water with the sun in the photo. Find out what settings give you the results you like. Third, shoot only silhouettes. You should have the blue color you like, and be comfortable getting nice dark silhouettes. Fourth, practice shooting foreground subjects; learn how to light them properly. Don’t worry about the background. Last, combine steps 3 and 4, shoot foregrounds with a silhouette in the background. It should all come together. The underwater lighting chapter covers strobe position, types of lighting, color temps, hotspots, and getting good blues. Taking wide-angle photos using the Canon G12 compact camera.